Crossing Pequea Creek, this bridge also known as Paradise Bridge or Leaman Place Bridge is located on the boundary between Paradise and Leacock townships on what was part of the original Ferree land. It has a single span, wooden, double Burr arch trusses design with the addition of steel hanger rods and a deck made from oak planks. It is 15 feet wide and 113 feet in length. 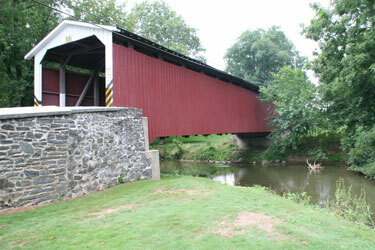 Both approaches to the bridge are painted in the traditional white color and the bridge inside and out is painted red, the traditional color of Lancaster County covered bridges. Originally built by James C. Carpenter in 1845 at a cost of $993, rebuilt in 1893 by Elias McMellen at a cost of $2,431 and was rehabilitated in 2004. The park on the north side of the bridge is an excellent area to take photos.